vi, 37 p. : ; 26 cm. 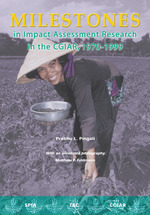 "With an annotated bibliography of impact assessment studies conducted in the CGIAR, 1970-1999, prepared by Matthew P. Feldman." "Standing Panel on Impact Assessment (SPIA), Technical Advisory Committee (TAC) of the Consultative Group on International Agricultural Research (CGIAR)." reflect policies of SPIA, TAC, the CGIAR, or CIMMYT. maize- and wheat-based cropping systems for poor farmers. this material is encouraged by the publishers. Proper citation is requested. as a useful guide to this significant area of CGIAR research. for the Consultative Group on International Agricultural Research (CGIAR). the CGIAR owe him our gratitude for leading the way. Head of Production, for editing and publishing this review. conducted within the CGIAR centers. distribution studies starting in the 1980s. the area of impact assessment research. concentrated in the first two categories. information on all CGIAR crops). profitability of adopting improved germplasm. adoption of new agricultural technology"
farm production, and credit studies. variation for fields over time (Table 1). shown the investment to be extremely profitable. Research Institute (IFPRI) (Pardey et al. 1992). countries, see Evenson (2001) and Alston et al. conducting sensitivity tests on various parameters of the models are not presented in this table. technologies for rice in the Philippines. of the impacts of farm mechanization. labor-abundant societies (see Pingali et. al. still the best pieces of work in this area. on improved fallows. McIntire et al. countries of Asia between 1973 and 1979. Pingali et al. 1994; Pingali and Roger 1995). wheat at CIMMYT (Smale et al. 1998). 1 Now the International Livestock Research Institute (ILRI). the Green Revolution in wheat. evolving biotic stresses such as diseases and pests. change across rice environments in Asia. effects on landless labor and tenant farmers. findings of all of these studies. conducted several studies on the subject. headed households differed very little. systems in China, India, and Pakistan. 1993; Antle and Pingali 1994; Pingali et al. was done soon afterward (Crissman et al. attributable to migrants from other regions. where the Green Revolution took off. in India. The term "backward linkages"
needs to be enhanced substantially. through research and then adopted. Source: Pardey et al. (1996). access to CIMMYT breeding materials. research priority setting in Latin America. to the participants in the network. will fill this large gap. future milestones can be achieved. performance in impact assessment research. done in as transparent a manner as possible. wider audience has been rather poor. the mission of the research institution. it discovery, development, or facilitation. publicity value of the results. the returns to agricultural R&D. Alston, J.M., G.W. Norton, and P.G. Anderson, J.R., and P.B.R. Hazell. Antle, J.M., and PL. Pingali. 1994.
of Tractors in South Asia. Binswanger, H.P. 1984., i .. .
Byerlee, D., and E. Hesse de Polanco. Byerlee, D., and M. Morris. 1993.
of International Wheat ... .
Coffman, W.R., and T.R. Hargrove. Crissman, C.C., J.M. Antle, and S.M. International, I .. ....' 'Research. David, C.C., and R. Barker. 1978. David, C., and K. Otsuka (eds.) 1994. Delgado, L.C., J. Hopkins, and V.A. IFPRI Research Report No. 107.
with an Annotated '. .
Echeverrfa, R.G., G. Ferreira, and M.
Evenson, R.E., and D. Gollin (Eds.). Evenson, R., and C. David. 1993. Fan, S., P. Hazell, and S. Thorat. 1998. Flinn, J.C., and D.P. Garrity. 1989. Flores-Moya, P., R.E. Evenson, and Y.
and Cultural C 26(3): 591-607. Franzel, S., D. Phiri, and FK. Wesiga. Zambia. In S. Franzel and S.
Hayami, Y., and R.W. Herdt. 1977. Moya, L.M. Bambo, and E.B. Peasant Economy: A Rice. .
Hazell, P., and S. Haggblade. 1993.
and the welfare of the poor. In M.
Hazell, P.B.R., and. C. Ramaswamy. Development and Cultural C'. .
Herdt, R.W., and C. Capule. 1983. Herdt, R.W., L. Castillo, and S.
i --.. Use of Insecticides on Rice. Herdt, R.W., and A.M. Mandac. 1981.
i. ..... Los Banos: IRRI. Maredia, M.K., and D. Byerlee (eds.). McIntire, J., D. Bourzat, and P.
Morris, M.L., H.J. Dubin, and T.
I ..-,.- .' Economics 70: 366-371. Pardey, P.G., J.M. Alston, J.E. Christian, and S. Fan. 1996. Pardey, P.G., R.K. Lindner, E.
Pingali, PL., M. Hossain, and R.V. Pingali, PL., C.B. Marquez, and F.G.
Pingali, P., and P. Roger (eds.). 1995. Londono, and E. Hoover. 1976. Rola, A., and P. Pingali. 1993. Scobie, G.M., and R.T. Posada. 1977. Scobie, G.M., and R.T. Posada. 1978. Sidhu, D.S., and D. Byerlee. 1992. Smale, M., R.P Singh, K. Sayre, P.
Pingali, S. Rajaram, and H.J. Traxler, G., and D. Byerlee. 1992.
production in India. In J.R.
Walker, T., and C.C. Crissman. 1996. Walker, T., and J. Ryan. 1991. .. Note: This bibliography covers many, although not all, of the studies cited in this publication. are encouraged to consult the authors of those studies or the original publications themselves. Antle, J.M., and P.L. Pingali. 1994.
of Agricultural Economics 76(3): 418-30. Binswanger, H.P., and J.G. Ryan. 1977.
and equity, are thoroughly examined. that are commercially cultivated in Australia. increased throughout the developing world. quality and preserving genetic diversity. in a stepwise fashion to minimize risk. underinvested? Food Policy 18(5): 381-93. Crissman, C.C., J.M. Antie, and S.M. farmer health, and environmental factors. and Rice in the Less Developed Nations. and for a few countries in Latin America. figure rose to 72.6 million hectares. analysis of fertilizer demand functions. fertilizer use in all three datasets. David, C.C., V.G. Cordova, and K. Otsuka. income distribution in the Philippines. In C.C. Technology and Income Distribution in Asia. environments to decrease the inequality. to clarify a few potential possibilities. impact of agricultural research. In R.G. for National Agricultural Research (ISNAR). pasture improvement in Latin America. Echeverria, R.G., G. Ferreira, and M.
other countries to realize high rates of return. An Analysis of Interlinkages in Rural India. stability and modern rice technology. In J.R.
Franzel, S., D. Phiri, and F. Kwesiga. improved fallows in Eastern Zambia. In S.
of Agroforestry Practices in Africa. maize has the highest overall yield. and Cultural Change 26(3): 591-607.
analyses on public breeding research. comes from spillins from outside the region. specialization and returns to scale. Hazell, P.B.R., and C. Ramaswamy. 1991. South India. Baltimore: Johns Hopkins. landless people in adoption regions. 1965, and factors correlated with adoption. rainfed rice area planted to MVs in 1979-80.
the farm are positively related to efficiency. Herdt, R.W., and T.H. Wickham. 1978.
experiment stations and in farmers' fields. potential yields of modern rice varieties. focus on these research areas. Paper No. 1. Outreach Division. insect pest problems on high yielding rices. Tropical Pest Management 35(3): 235-42.
pests have become more difficult to control. Lopez-Pereira, M.A., and M.L. Morris. maize, was planted to improved maize. under local and improved varieties. Mclntire, J., D. Bourzat, and P. Pingali. Morris, M.L., H.J. Dubin, and T. Pokhrel. achieve a relatively high rate of return. Moya, T.B., W.C. de la Viha, and S.I. season to evaluate the benefits of an OFR. ratio of OFRs to be 5.1.
control of cassava mealybug in Africa. Palanisami, K., and J.C. Flinn. 1989.
and S. Fan. 1996. Hidden Harvest: U.S.
Benefits from International Research Aid. on women in Asian rice farming. In P.L. Perrin, R.K., D.L. Winkelmann, E.R. Manual. CIMMYT Information Bulletin 27.
should not be recommended to farmers. Pingali, P.L., and R.V. Gerpacio. 1997.
removed and replaced by taxes. Pingali, P.L., C.B. Marquez, and F.G.
evaluate the health effects of pesticide use. reduce the harmful effects on farmer health. assumptions of supply elasticity and cost. Quisumbing, A.R., L. Haddad, and C.
Evidence From 10 Developing Countries. (FCND) Discussion Paper No. 9.
farms, and poor and rich urban dwellers. economic threshold, and complete control. distribution: The case of rice in Colombia. majority of the benefits of the research. input and output prices, and productivity. Rice. Boston: Kluwer Academic Publishers. used to measure and value genetic diversity. of conserving seed ex situ, in gene banks. of crop genetic resources in farmers' fields. Smale, M., R.P. Singh, K. Sayre, P.
Pingali, S. Rajaram, and H.J. Dubin. 1998.
research in a post-Green Revolution setting. entire CMR portfolio in this study was 16%. cereal varieties in developing countries. the price of fodder is relatively higher. for quality improvement in Southeast Asia. regional estimates of returns to research. von Braun, J., and P.J.R. Webb. 1989.
communal lands under the control of men. and Policy in Developing Countries. covariance over the two time periods. Walker, T.S., and C.C. Crissman. 1996.
from the International Potato Center (CIP). Dominican Republic, Vietnam, and India. IPM research, and various seed projects. and Wheat Improvement Center (CIMMYT). will be higher than intensive input research. higher yields, but varieties are more stable.